is widely recognized as one of the foremost traditional nut crackers on the market. 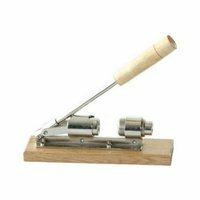 Perfect for breaking open all medium and soft-shelled nuts, including English walnuts, the Duke's Nut Cracker is very simple to operate. Made entirely of steel, the handle is comfortable to clasp and the steel lever is durable and long lasting. The cracking cup can be reversed to crack even the smallest Native Pecans.